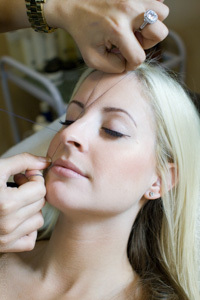 Laser hair removal services provider more permanent removal of body hair than waxing or shaving. It requires a series of treatments to achieve permanent results. Try this innovative technology if you are ready to permanently say goodbye to that pesky, unwanted body hair. 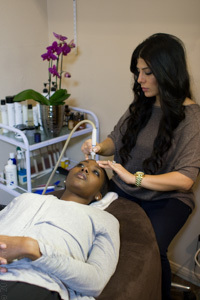 Our Licensed Laser Technician has been performing Laser Hair removal for 8 years and uses only the "Yag" laser which treats all skin types and colors. Ask about our packages for multiple areas. All prices are per treatment. UV Teeth whitening services are offered to restore and brighten your smile at a fraction of the cost of more invasive cosmetic dentistry services such as veneers. Cleanse, refresh, exfoliate and pamper your skin. Salt and sugar body scrubs are a great way to prepare for a massage, bodywork or other services. Select from salt, sugar, apricot seed and other all natural Exfoliating Body Scrub products. Acupuncture and reflexology services employ the ancient Chinese knowledge of pressure points and meridians within your body to direct and focus your life force for therapeutic healing and wellness. All acupuncture procedures are preformed by a licensed acupuncture physician. Acupuncture and reflexology services employ the ancient Chinese knowledge of pressure points and meridians within your body to direct and focus your life force for therapeutic healing and wellness.